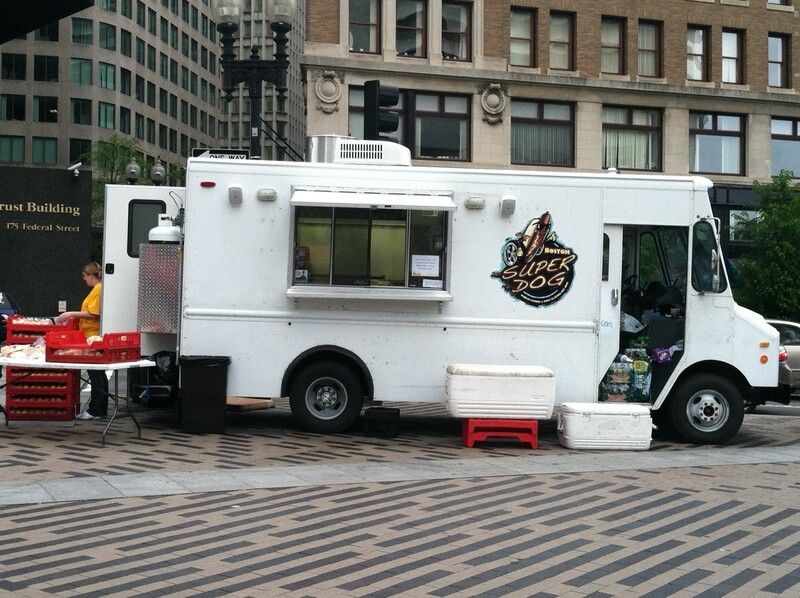 This past Saturday May 5th Dewey Square hosted the Greenway Mobile Food Festival featuring over 15 Boston food trucks. 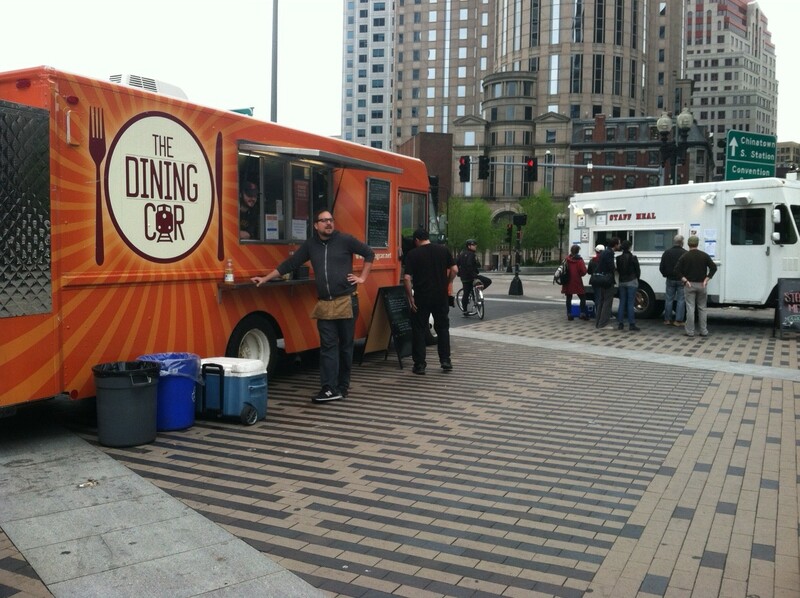 From 11:30am-7pm, the greenway was packed with fro yo, BBQ, grilled cheese, cupcakes, gourmet sandwiches and more. I was only able to attend for the first 45 minutes, but guests who visited later in the day were treated to live performances and a cook off. 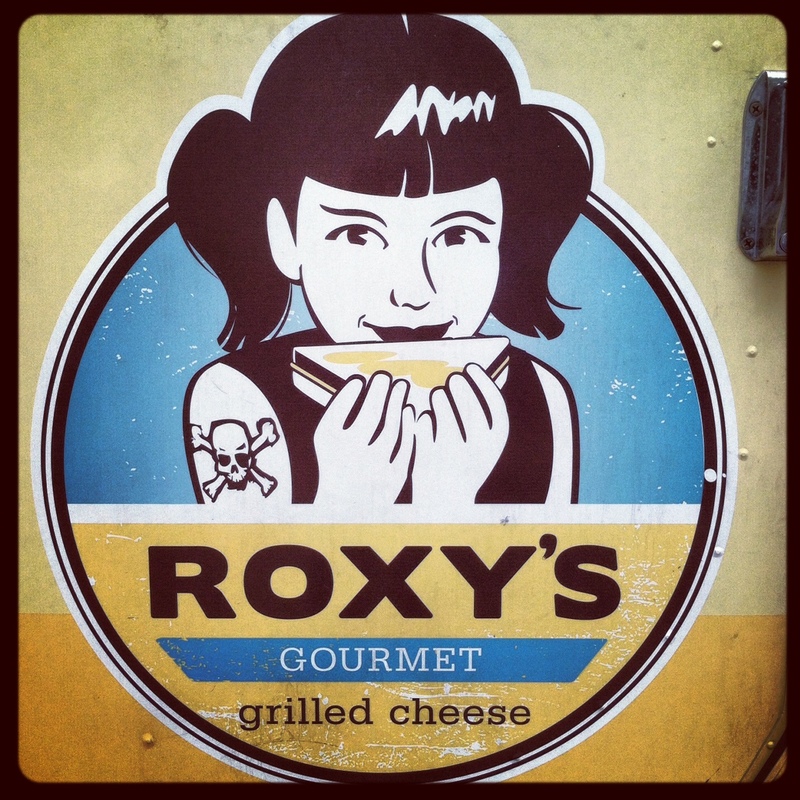 My heart was set on finding Roxy’s Grilled Cheese and indulging from there, but I made sure to save room for at least one other sampling. Mei Mei Street Kitchen serves up modern Chinese-American food and today they were offering a variety of interesting meals. 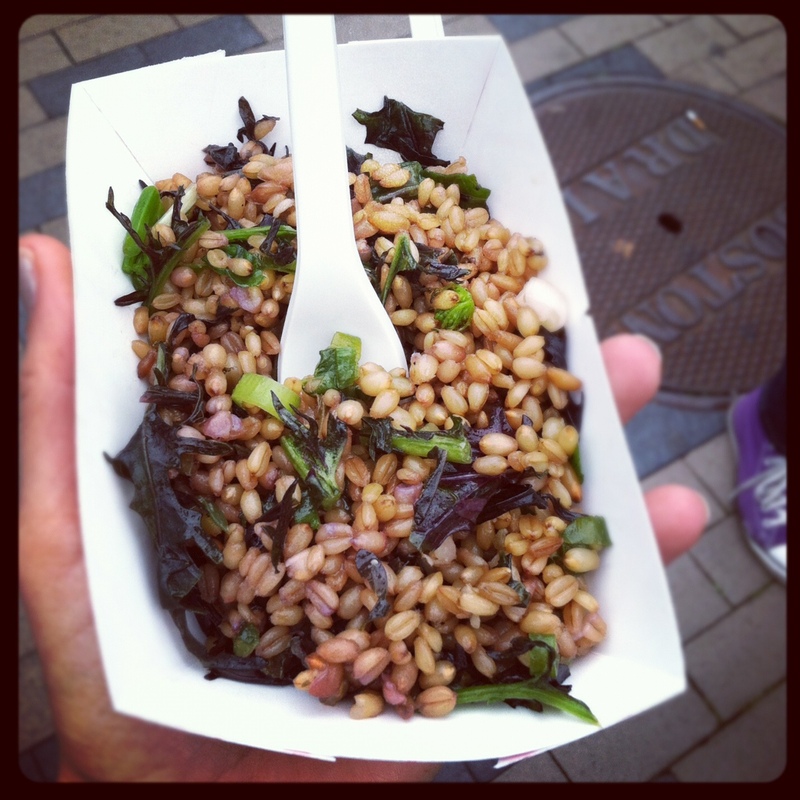 I went with the local wheatberry salad with mustard greens & honey. I’ve never had wheatberry before so I wasn’t sure what to expect; it resembles farro but has a harder more solid consistency. Not a bad side dish that would probably pair well with any meat entree. 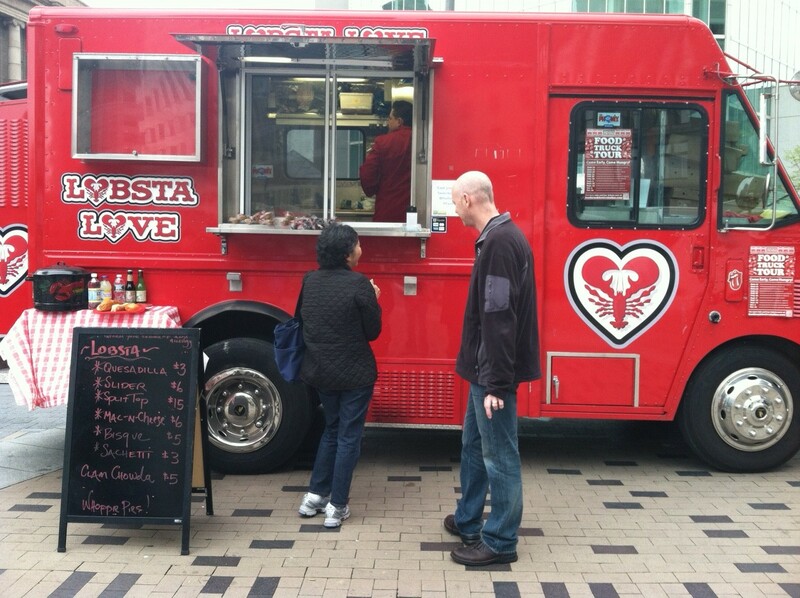 I was lucky enough to stop by Lobsta Love as they were handing out free samples of their Lobster Bisque. 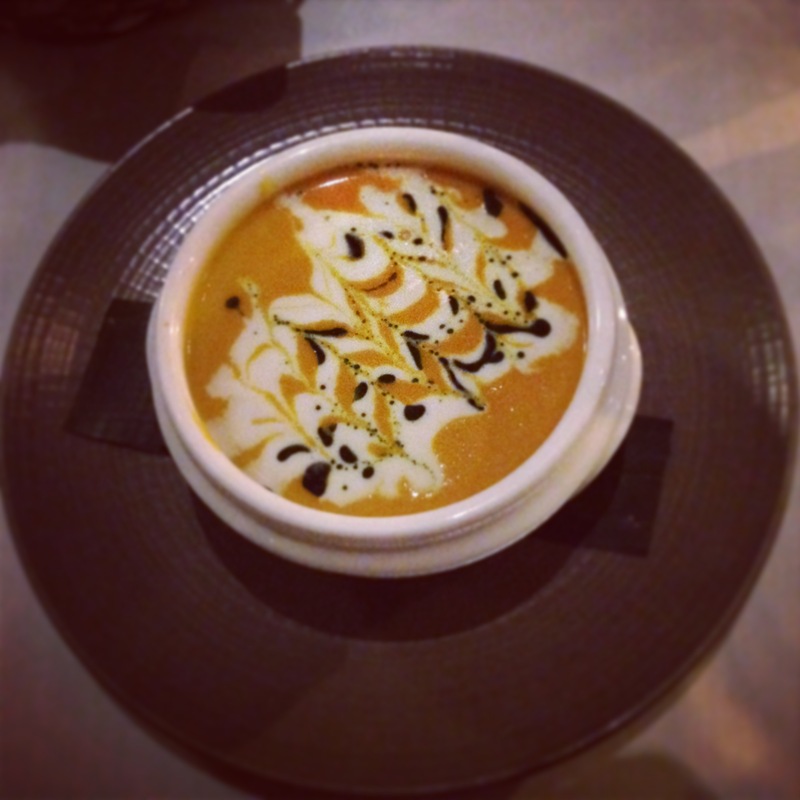 Creamy, rich and flavorful, I could have easily had an entire bowl of this. Although if I had to choose an item from their menu I think I would have tried the Lobster Quesadilla. Oh Roxy’s. 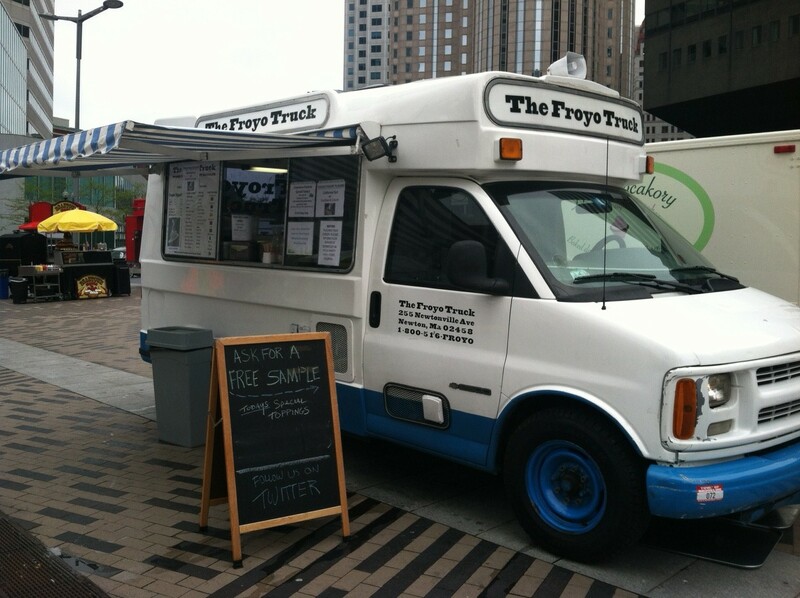 I’ve heard so much about this truck, mainly because it was featured on the Food Network’s “The Great Food Truck Race”. 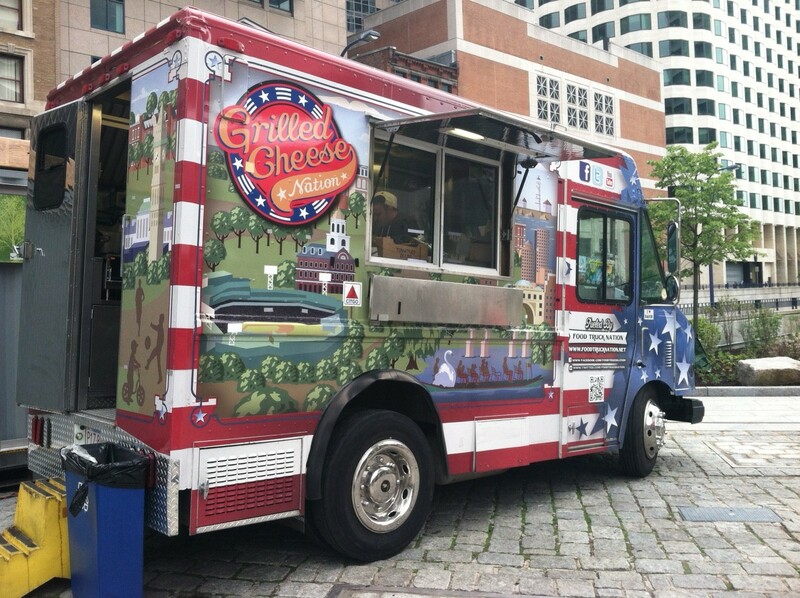 This rebel child with the skull & cross bones tattoo has been taunting me for months, and finally I was able to try one of these famous cheese sandwiches. 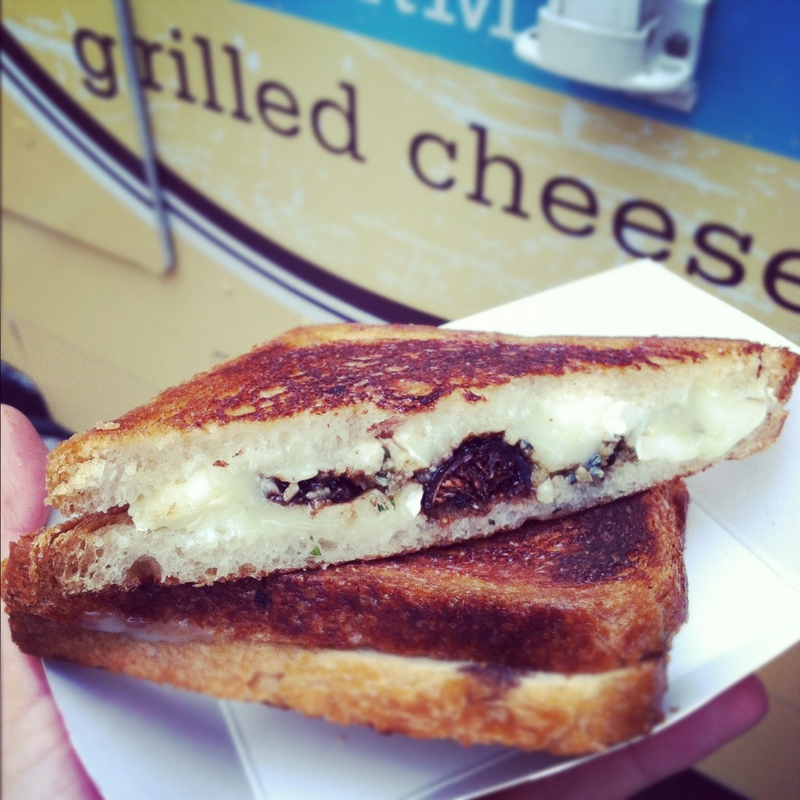 Every item on the menu was tempting but I couldn’t say no to the Brie Melt with balsamic soaked mission figs & walnut pesto. Buttery, crispy, and oh-so-cheesy, this sandwich was rich and delicious. While I loved every element, I could do without the excess butter/grease. I found myself holding it with a napkin to avoid having grease soaked fingertips. But hey, grilled cheeses aren’t a health food or a light & refreshing treat; they are what they are, a cheesey comfort food that never goes out of style. 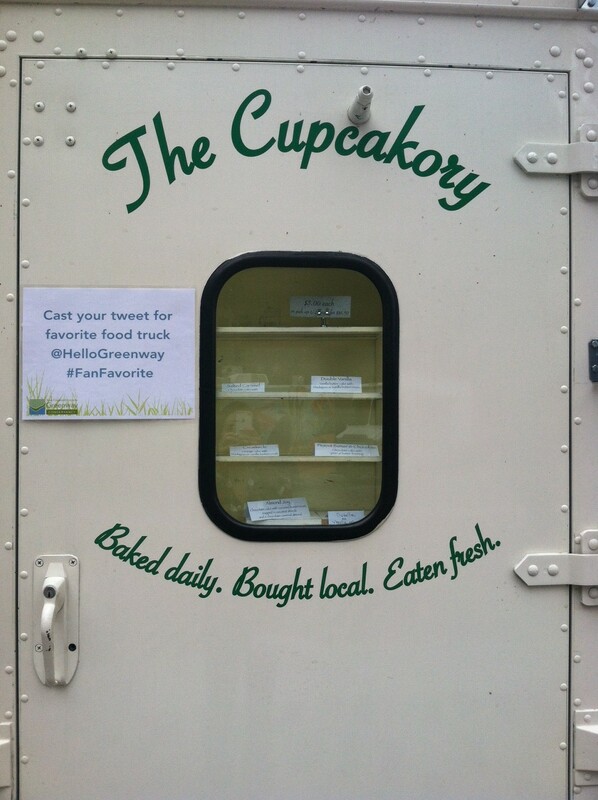 I wasn’t able to try any of the other trucks, but I’ve made mental notes and hope to experience some soon! 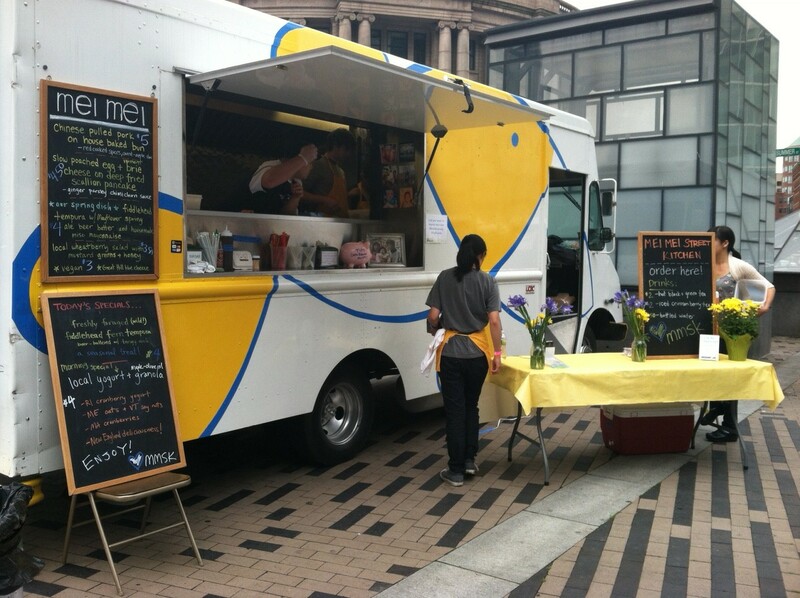 Bon Me offers “Bold, Fresh, Fun Vietnamese Cuisine”. 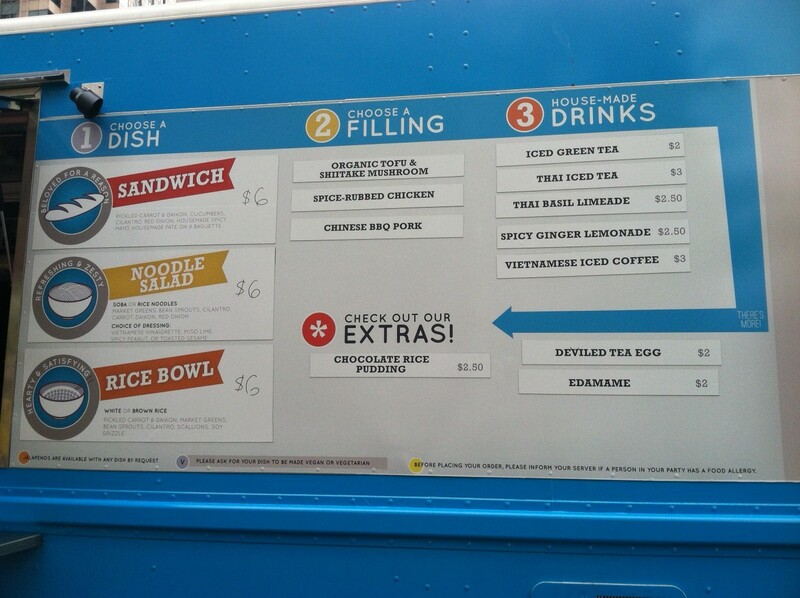 While this typically isn’t my style, I was intrigued by their Sandwich, Noodle Salad, or Rice Bowl menu. 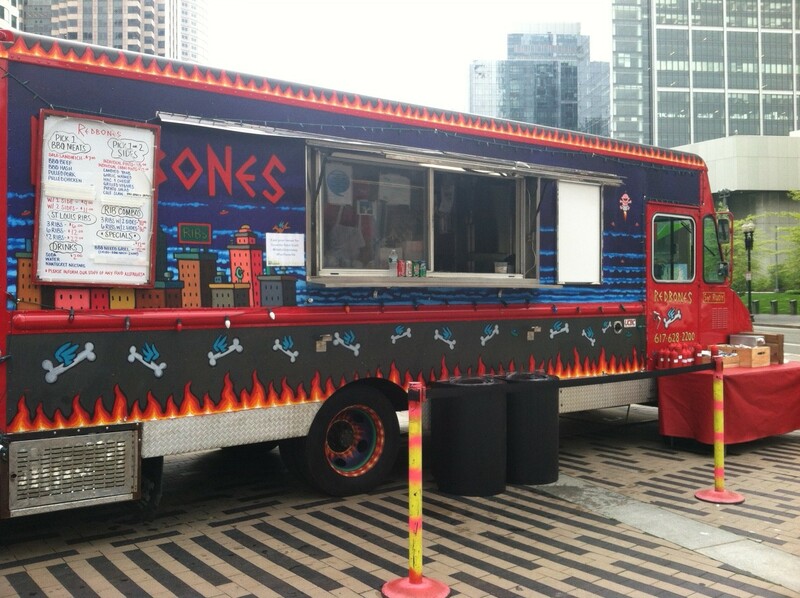 Next time I see this truck I’ll have to try to Chinese BBQ Pork sandwich, yum! Jason Santos of Hell’s Kitchen brings a hip new American eatery with Asian flare to the Financial District with Blue Inc. Even before my co-worker started raving about it I knew it was a must try. Located at the end of Broad Street, it attracts the after work crowd but after building up a reputation I’m sure people will be flocking from places near & far. 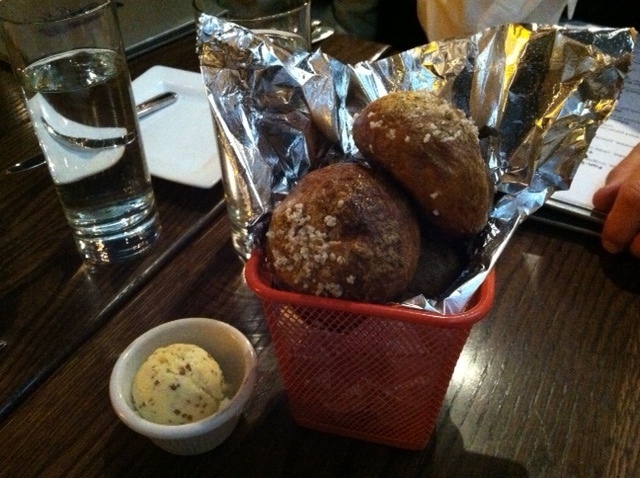 Bread: Four pretzel bread rolls were wrapped in tin foil and served in a red metal basket with a side of mustard butter. 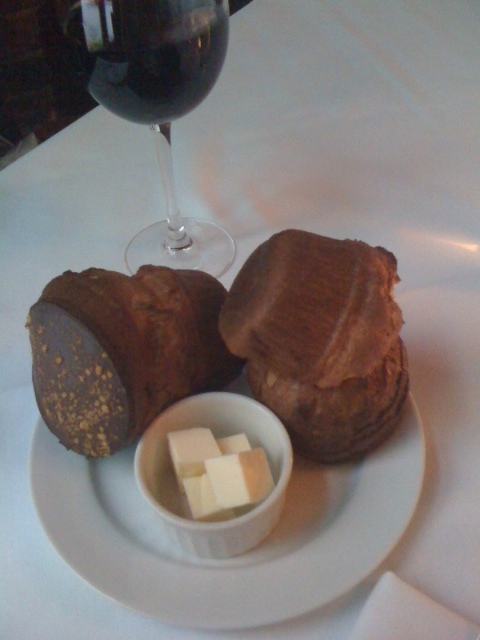 The bread was warm, salted, and so excellent with that infused butter. One of the best bread baskets I’ve had in a while! Menu: The Dinner Menu offers Apps and Mains, many of which I was interested in. I had checked out their Bar Menu online and knew I needed to order a couple of items from there, which our waiter allowed us to do. The only thing that wasn’t available to us was the bar Bucket Menu which offers small bites from $1-$7 served in a Blue Bucket! 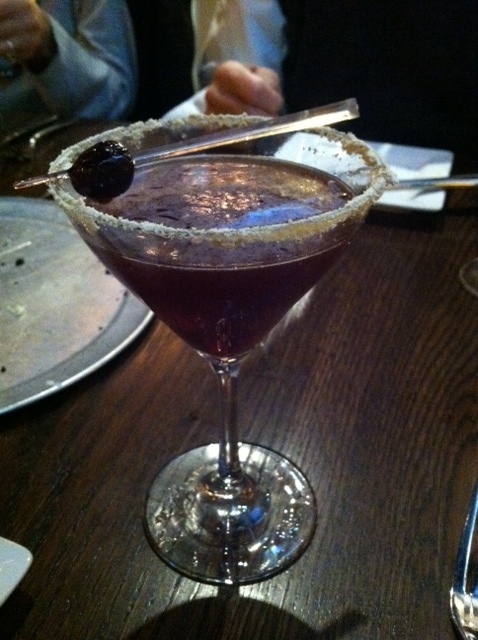 I’d also like to mention that the cocktail menu is unique and fun, with items like ‘Dinner and a Movie’ (buttery popcorn rum, pepsi, malt balls) and ‘Fizzy Lifting Drink’ (pear-cranberry infused tequila, poached cranberries, fizzy salt). The list goes on, and it’s intriguing! Now that I think of it, we asked for this with the prosciutto but didn’t get it! 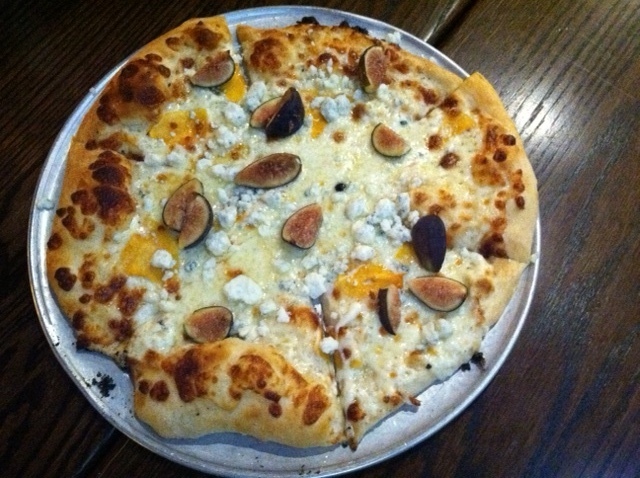 It was so delicious though that we completely forgot; I was mesmerized by the size of the fig pieces and contrasting flavor of the butternut and blue cheese. Really amazing pizza! A large shallow bowl came full of 2 tortelloni and a small cup which the waiter poured the bisque from. 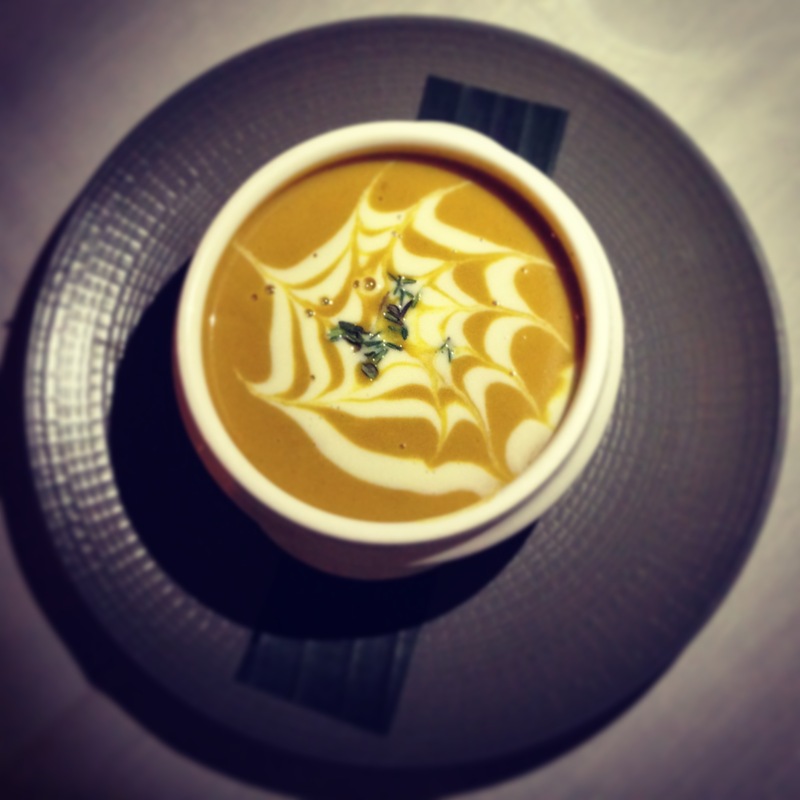 The soup was great, smooth and flavorful. 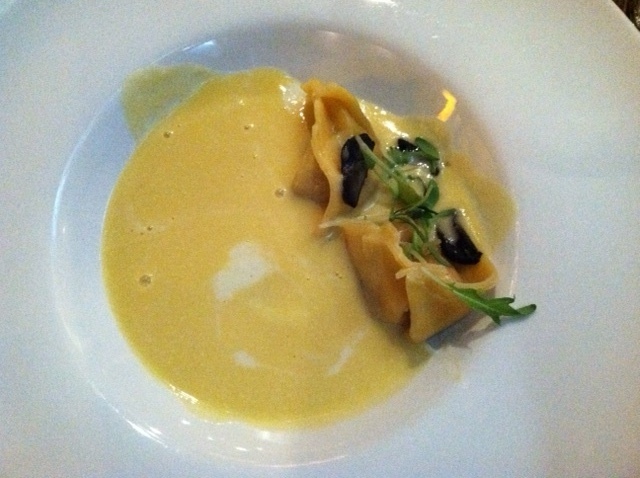 The tortelloni was a nice touch; without that addition it may have been too simple/plain. 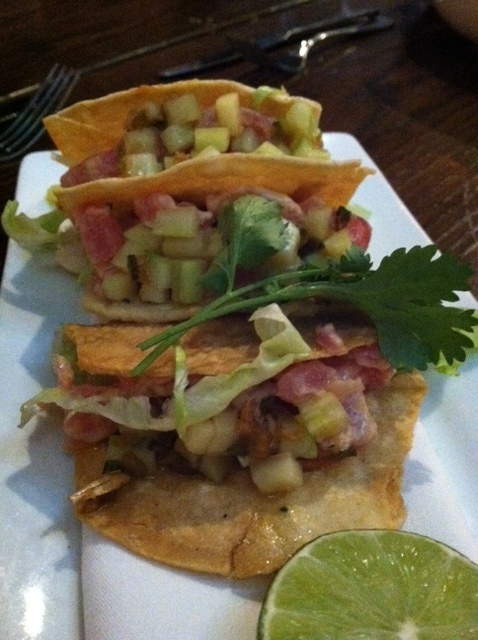 Three tacos came side by side filled with diced tuna and cucumber, lightly tossed with spicy mayo. The shells were nice and crispy as they should be. I could have used a little more sauce but I appreciated that it wasn’t overpowering. Great portion for me! Bathroom: The restroom isn’t exactly located in the restaurant; you have to walk through the entryway and down a long hall to the back of the building. 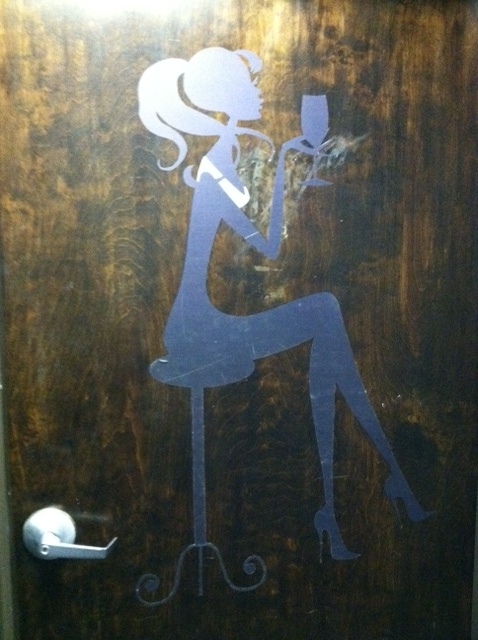 Each door has a funky silhouette of a lady and gentleman. 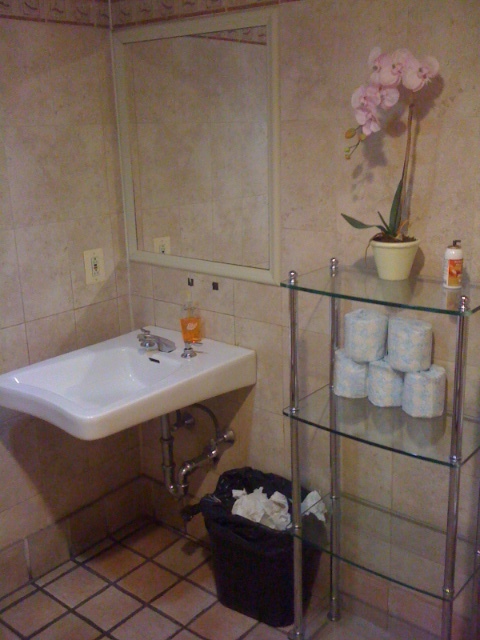 The interior was clean but there wasn’t any toilet paper in the lady’s room both times I went (I sure did sneak into the men’s room to steal some). They could use some more decorations but the flowers were nice. 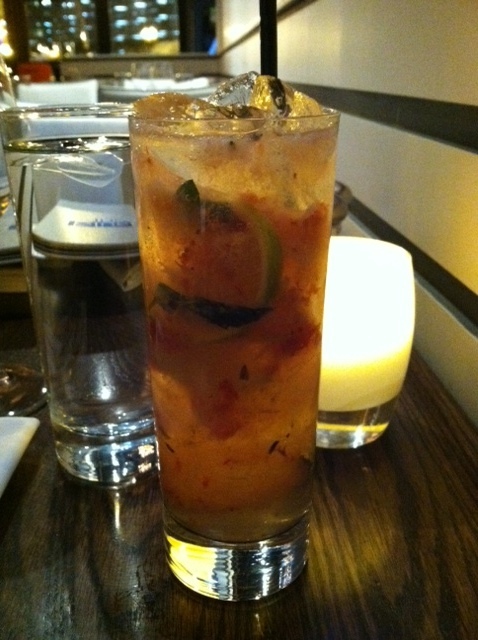 Service: Our waiter was great and was able to get me a glass of the Strawberries Fields Forever cocktail, even though it’s a seasonal summer beverage. I also asked for the Bar Menu (knowing I wanted to Spicy Tuna Tacos) so he brought that over without hesitation. Everything was served in a timely manner and he filled our water glasses when they were low. Overall: My parents, Matt & I all really enjoyed our evening; every bit of food we tasted was excellent from mom’s Cabernet Braised Short Ribs to dad’s Hand Rolled Sage Gnocci. 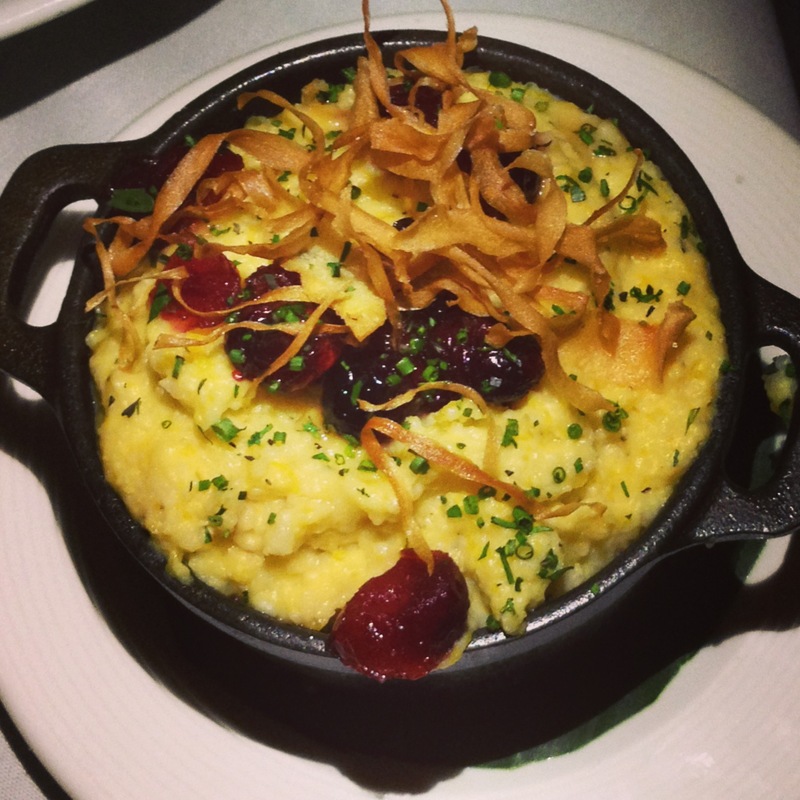 I’d love to go back for their Grilled Salmon dish, and even the Pan Roasted Natural Statler Chicken Breast sounds amazing (rosemary polenta, yes please!). 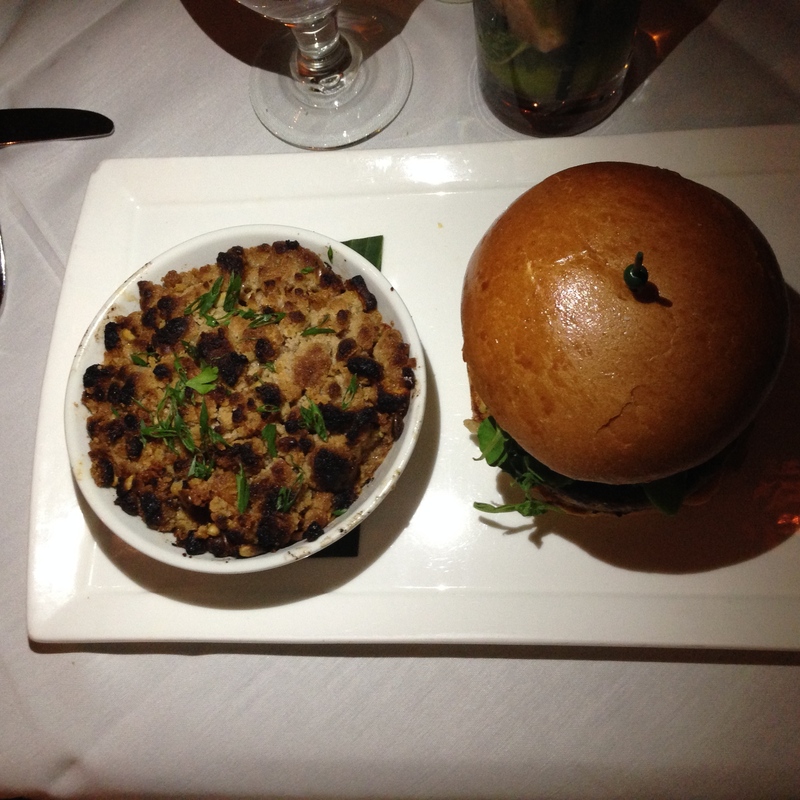 The prices weren’t outrageous with entrees topping out at $26, and the apps and bar menu ranging from $5-$19. 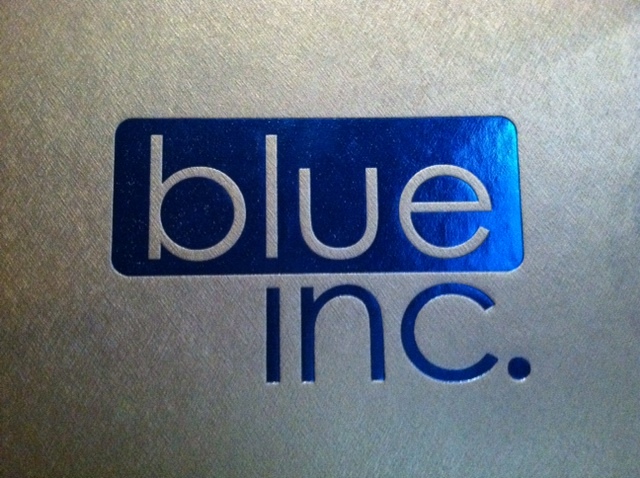 Blue Inc. certainly makes a statement, esp. 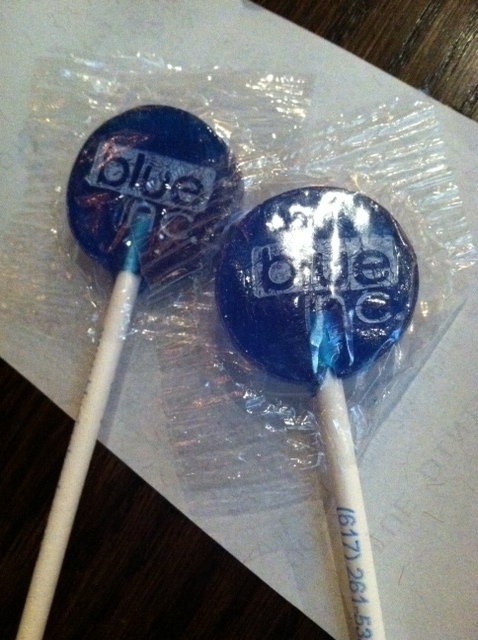 with its pretzel bread and blue lollipops they give out with the check. It’s a small interior but has a lot of flavor and sass; I can’t wait to go back! 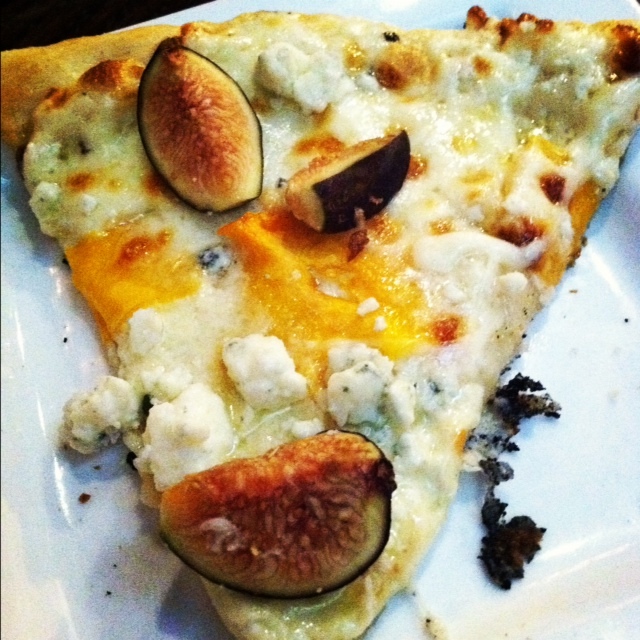 The Perfect Bite: A slice of that white pizza with a giant piece of fig! Unbelievable. 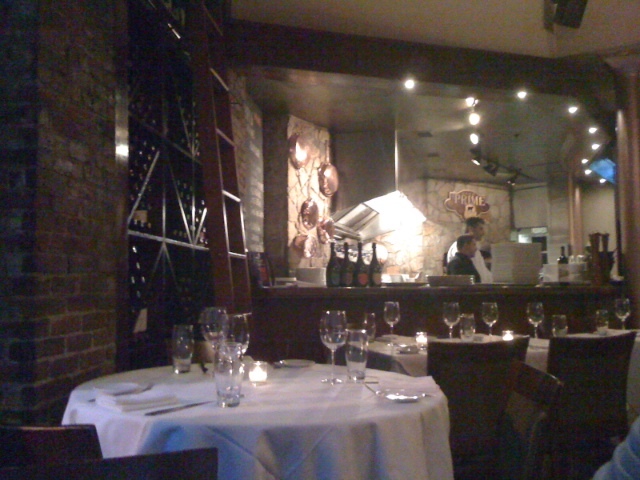 Umbria Prime is a high-end steak house located in the heart of the Financial District on Franklin Street, blocks away from Post Office Square. 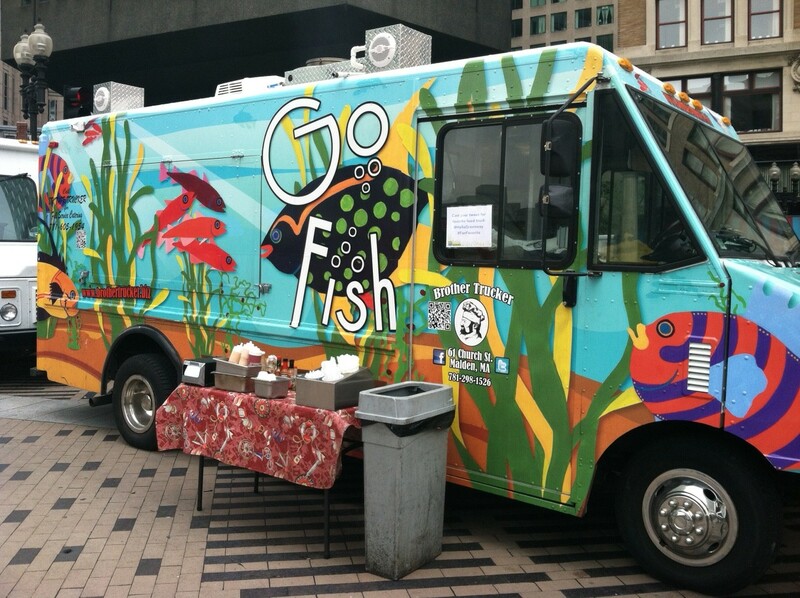 Not only does it offer corn and grass-fed certified Angus beef, but the menu also features seafood, salads, and artisan pastas. Show up late night and the 3rd, 4th, and 5th floors transform into a night club for the 25+ crowd. I don’t know that I’m ready for that just yet, but I was looking forward to a good meal. Bread: I guess I’ll call these popovers? Reminds me of a pastry you’d receive at brunch. The bottom was quite thin and useless, but the top was soft and doughy, great with a bit of butter spread. Slices of fresh tomato alternated with slices of buffalo mozzarella to create a Caprese tower. Basil leaves were off to the side and a basil pesto was drizzled for dipping. 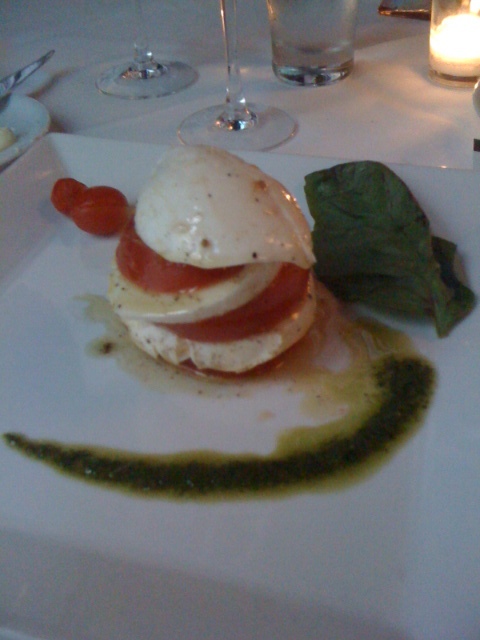 Honestly one of the best Caprese salads I’ve had, mainly because of the soft, fresh mozzarella. I’m still confused… The above description is exactly what I read off the menu, yet I received a pasta dish covered in mushrooms! 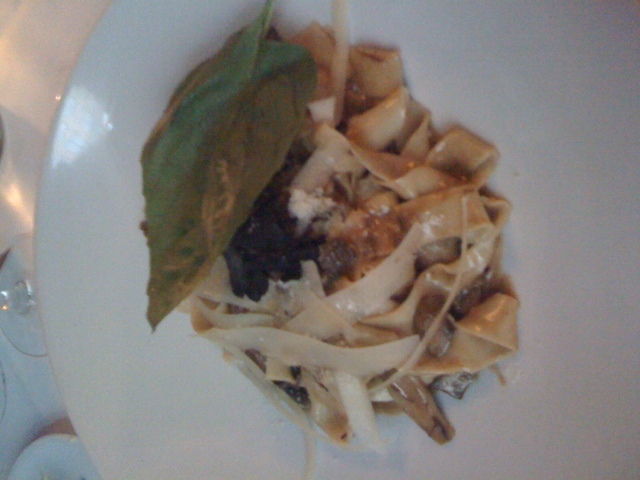 I thought at first ‘maybe I was served the Tagliatelle’ which comes with “exotic wild mushrooms and fresh truffle shavings”, but then overheard our waitress describing that entrée to the table next to us and she mentioned it came with a red tomato sauce. There were no tomatoes in sight on my plate so I assume I received the correct meal. Unfortunately I’m not a big mushroom fan but have recently developed a tolerance for the fungi, so I was able to somewhat enjoy it. A ‘shroom lover would have been in heaven – it’s a shame I was deceived by the menu! 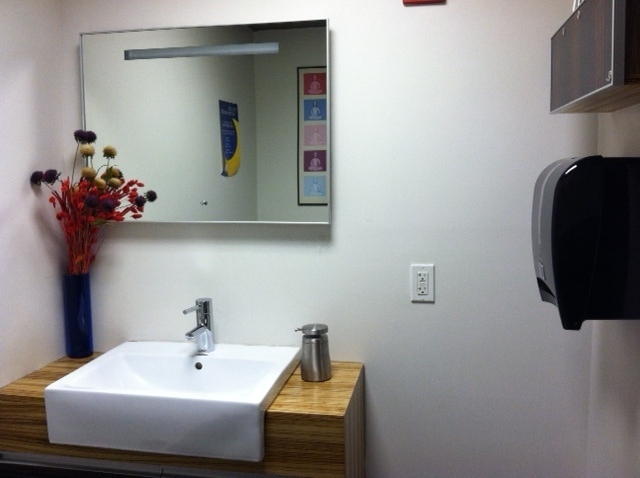 Bathroom: Located outside of the main restaurant in the foyer of the back entrance. Nothing special; for an upscale restaurant I would have expected something more stylized/fancy. Not a fan of the rolls of toilet paper on display. Wait Staff: Our waitress was great and offered to let me try a couple of wines when I couldn’t make up my mind. She was attentive, knowledgeable, and friendly! Overall: Definitely more of a fancier/upscale restaurant with its white linens and wait staff suited in crisp, white button downs and ties. Being in the financial district I can only assume it attracts a lot of business executives, but as it was the Friday before Memorial Day weekend there were only 3 other tables occupied. 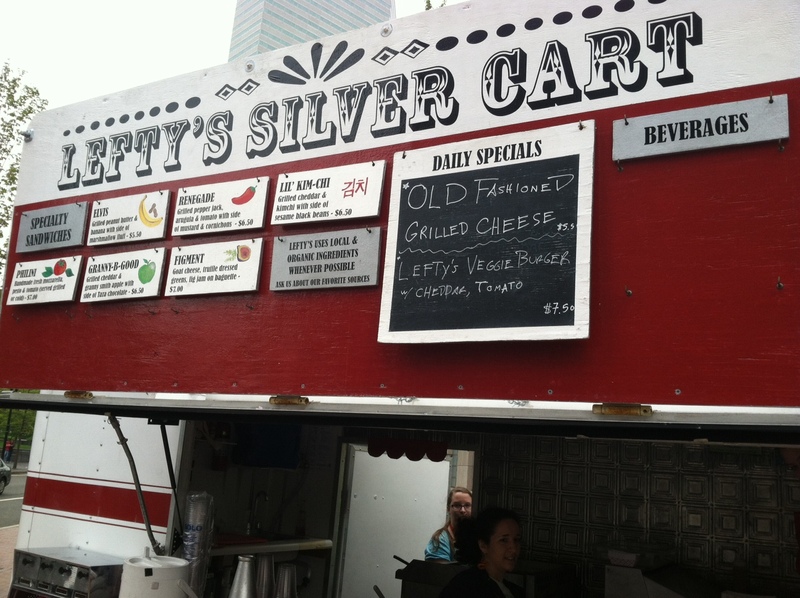 The portions are large – Matt’s tuna steak was double anything we’ve ever seen – but so are the prices. We chose Umbria strictly because we had a $100 gift card 🙂 Thanks mom! The Perfect Bite: Mozzarella, tomato, basil – hands down! I’d say it was solely the mozz, but this Italian girl adores her Caprese salads. 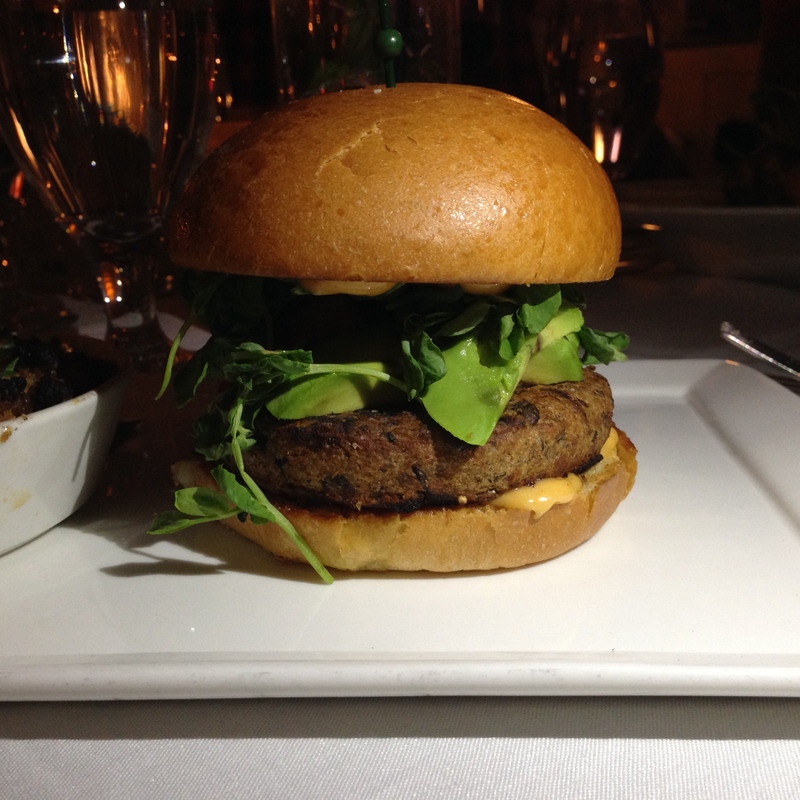 Ah yes, it’s that time of year again… restaurant week begins! For my first of three reservations I decided on Radius with my boyfriend & parents. Located on the corner of High Street & Summer Street in the financial district, Radius’ chef Michael Schlow presents you with modern French cuisine in a chic & elegant setting. The main dining room is shaped in a ½ circle with tables lining the perimeter, and more seating in an intimate inner circle, complete with tables & booths. Red lighting lines the top of the wall encompassing you in a warm tone. Unfortunately, we were not really able to experience this atmosphere as we were seated in a small side room with three other tables. While this room was an open continuation of the central area, I felt a little secluded as the main décor did not extend into this room, leaving it a bit dull. I was hoping the meal would make up for the lack in atmosphere. Bread: Before the bread was served we were brought a small tasting from the chef; in a miso soup spoon was a braised brussel sprout, tomato confit, bacon, & crispy bread. I’m not a huge brussel sprout fan, but the tomato added a nice touch. Shortly after, everyone was served their own individual roll accompanied by two plates of warm butter triangles for the table. 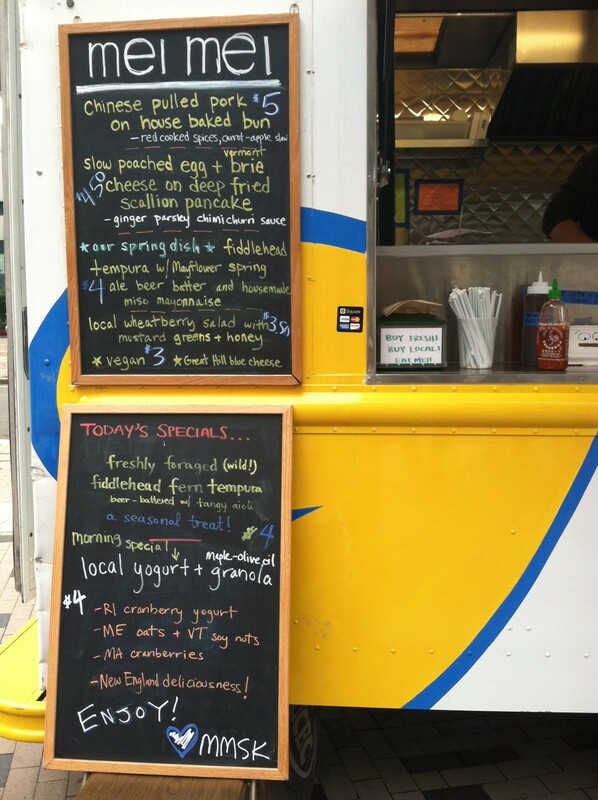 The bread was warm & crispy, and I was surprised & delighted to learn it was sourdough! Menu: In a rectangular leather booklet, we were presented with 2 options for the first course, 3 for the main course, and 2 for dessert. The rest of the menu was still available, but each item had an additional cost on top of the $33.10 you were paying for restaurant week. Having studied the menu the night before in anticipation, I already knew what I was ordering: cauliflower soup, lightly seared salmon, carrot cake “a la Radius”. 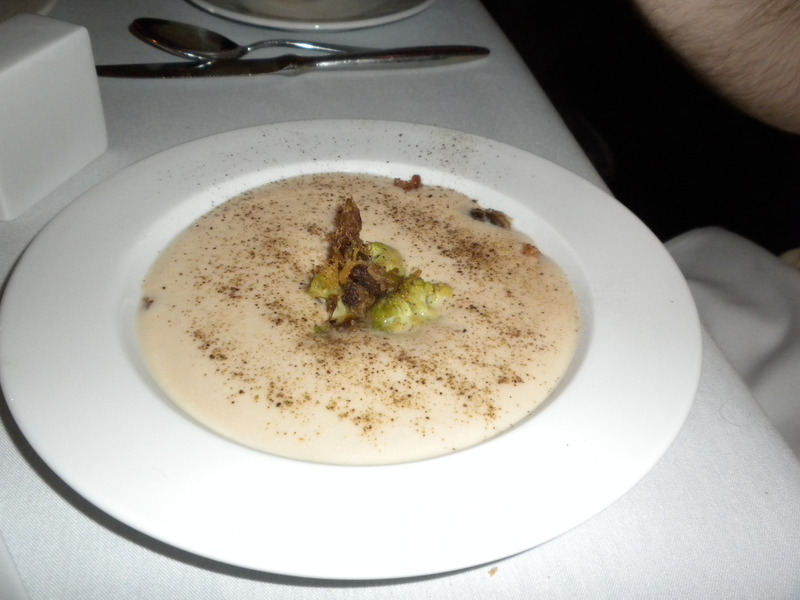 Presentation: I was brought a shallow bowl that contained the crispy duck, brioche croutons, & romanesco, and the cauliflower soup was poured in front of me out of a cast iron kettle. Deliciously creamy without being too rich or heavy, this was a great start to the evening. The brioche croutons & few pieces of duck added a nice touch. My salmon was presented on top of local braising greens & a pile of warm lentils. While it was cooked perfectly, the cumin vinaigrette wasn’t as strong as I was hoping, so the dish lacked that special something that would have separated it from all the other salmon dishes I’ve had in the past. Absolutely tasty, but I was expecting something more, something different. The carrot cake interested as it came disassembled, each ingredient on a different area of the plate: cake topped with long & thin carrot shavings, cream cheese frosting, warm ice cream piled on some walnuts. The cake itself was great and tasted even better with the sweeter than usual ice cream. A creative & fun way to present a dessert! 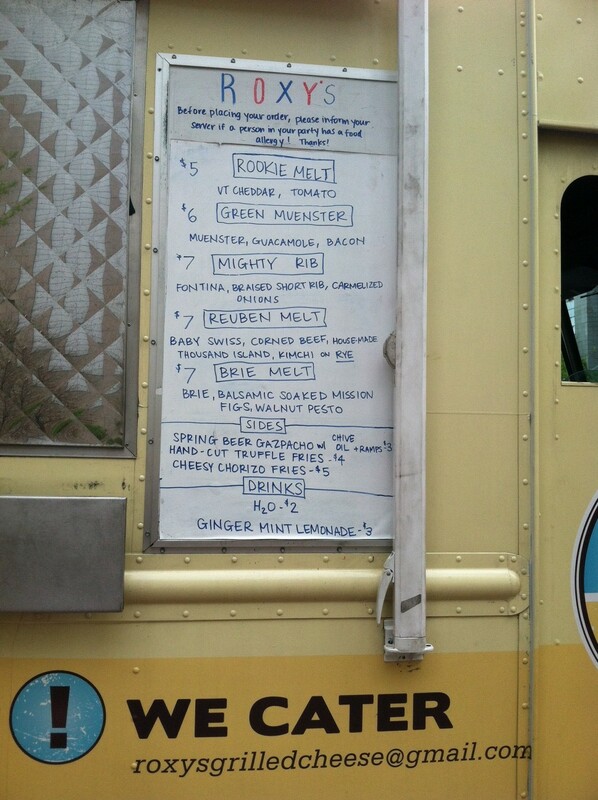 Wait Staff: Our waitress was nice & knowledgeable, and always had a smile on her face. The manager came over during our main course to make sure everything was to our liking, which it was. After the entrée, the waitress brought a crumb scraper over to clear off our tablecloth which I always enjoy (I’d love to get one of those little gadgets for my house!). There was a bit of a wait between the bread and our first course, and our dinner ended up being 2 ½ hours, which I think goes down in history as the longest meal I’ve ever had at a restaurant. I’m not necessarily complaining since I like making an event out of dining out, I just wasn’t expecting to be rolling myself out of there at 9pm. Bathroom: To get to the restrooms you have to ascend down this beautiful wide marble(?) staircase and pass through a lounge/wine bar. Complete with a wine vault (this building use to house a bank), bar, and comfortable seating, I felt like I was in a hotel lobby. 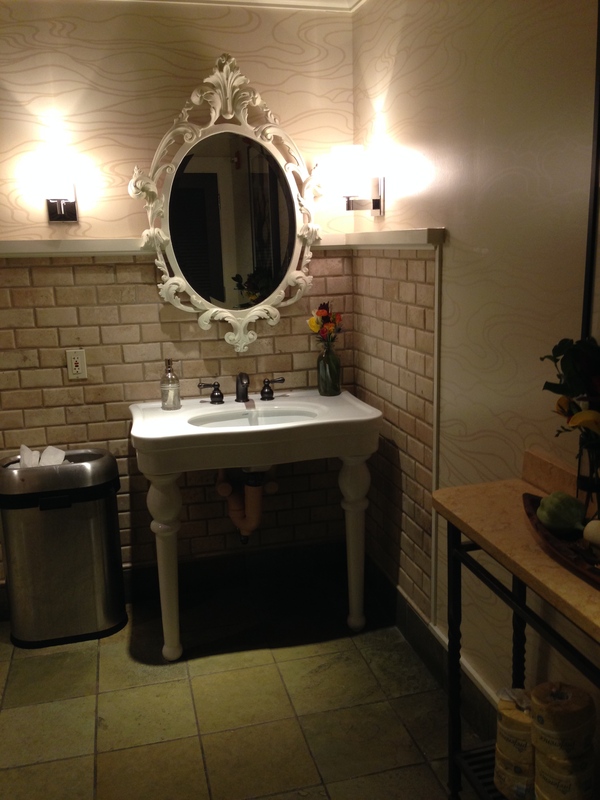 The bathroom itself was one of the larger ones I’ve seen; when you first walk in there is a small seating area with two low stools with thick cushions that are in front of a large mirror. This leads into the section with the stalls; there were at least six, and each had a small shelf for your purse. The sink countertop was like a deck floor, with narrow sections of dark wood. The sink itself was a large white bowl, raised up and placed on top of the counter. I enjoyed the spacious & modern feel. Overall: I personally feel like atmosphere is a large part of dining out, so I felt as though I missed out on the full Radius experience by being placed in that side room. None of us were disappointed with our meals, but I think we were expecting a bit more; perhaps more originality with the salmon, maybe a larger portion of the panna cotta dessert that my father had trouble finding on his plate. It is generally an expensive spot, so I won’t be rushing back, but if I do return I’ll make sure to eat in the main dining room and perhaps I’ll have a different take. I did appreciate the bite sized after dinner treats that were brought with the check: lime meringues, raspberry gelatins, and orange biscottis. The Perfect Bite: The cauliflower soup was absolutely the highlight of the evening. 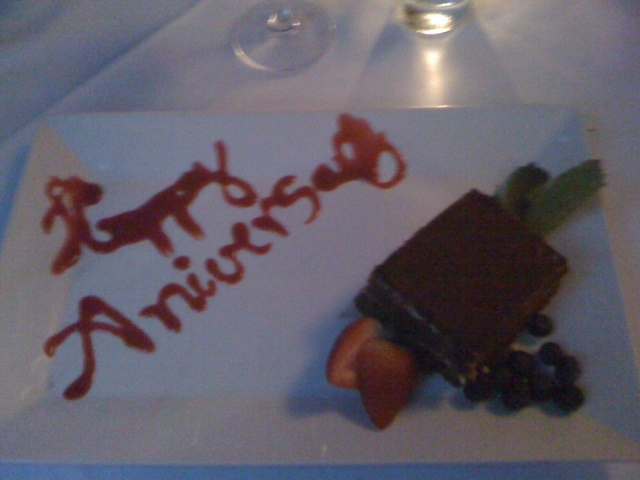 I love how it was presented and it was even more delicious than I was expecting. The pieces of duck added great texture to the smooth & creamy dish.